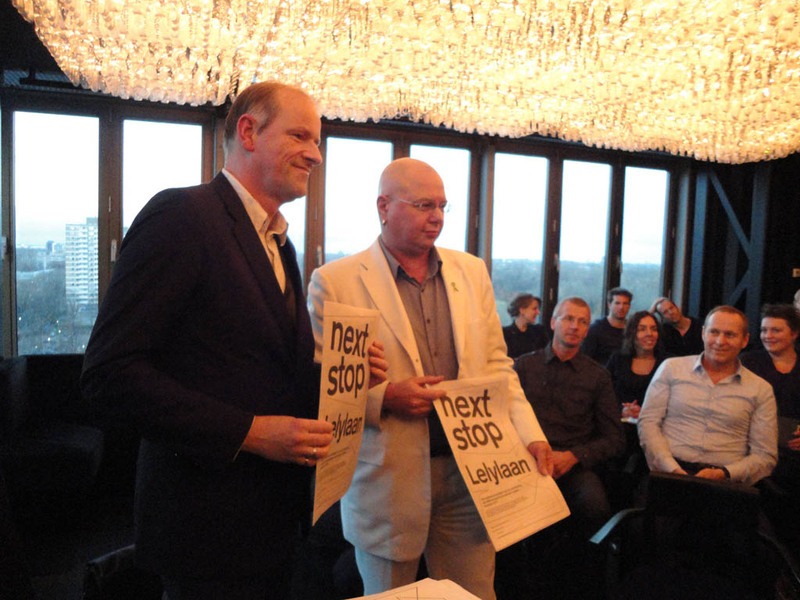 Yesterday was the festive presentation of a newspaper called Next Stop Lelylaan to alderman Paulus de Wilt, Allard Jolles of Bureau Rijksbouwmeester and many other guests a the Skyy Lounge of the Fashion Hotel. Next Stop Lelylaan investigates what potential is hidden in the temporary empty lot next to the Lelylaan Station in Amsterdam. This lot and many others come available now the Netherlands faces a radical stop in construction; buildings have already been demolished but it is unclear when and if construction will commence. What can we do in the mean time? At the same time the paper presents ideas that aspire to reinforce the magnetism of this gloomy Station. How can we put Station Lelylaan on the map? Next Stop Lelylaan is a collaboration between sociologist Anne Hemker (Stadstij) and photographer Lard Buurman, urban planners Jaco Kalfsbeek (DRIVE: 3d) and Mark Eker (Eker en Schaap Landschapsarchitectuur), graphic designer Johannes Verwoerd and NL Architects. This entry was posted on November 24, 2010 at 9:05 pm and is filed under Uncategorized. You can follow any responses to this entry through the RSS 2.0 feed. You can leave a response, or trackback from your own site.